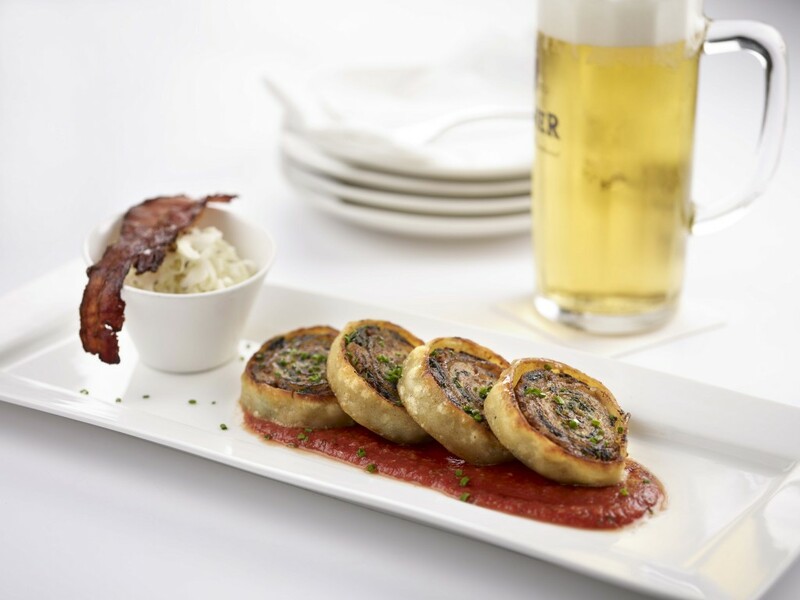 With its name a mix between the literal promise of time and a hungry reminder of bread, the popular German bier bar and restaurant Brotzeit is back with numerous beefy additions to its lunch and dinner menus. Whether you are a working bee or carnivore, you will be spoilt for choice between beef, pork, salmon… or German sausages. We started off with Aufstrichteller, a medley of pâté choices (bacon with apple, cream cheese, and smoked salmon tartare with chives) designed for company with two generous bread baskets. This neat and light starter whetted our appetites appropriately when passed around the table, and provided the right excuse for beer or wine. The Camembertsalat, a refreshing salad tossed with breaded camembert, orange wedges, cranberries and carrot shreds, is another starter we would like to try the next time we go back in a smaller group. The mains came as a collective whole, and the situation was momentarily akin to a castle feast spread. Plates and bowls of all different types of meat were heaped on to the table as we watched helplessly, only waiting to start eating. We went for the Steak Sandwich (yes, this dish is missing its exciting German name) first, a beautifully char-grilled beef striploin served on a huge piece of multigrain bread covered with caramelised onions. 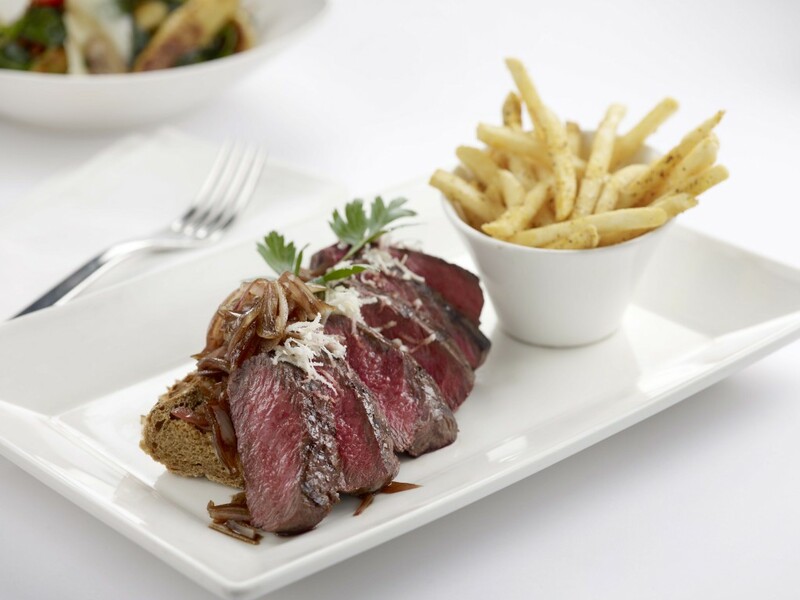 Potentially deemed to be the classic lunch choice, the beef definitely spoke for itself. Other sandwich options include two types of juicy thick German sausages and tons of fries. The Maultaschen stole the limelight of the table. Lying in its bed of tangy tomato sauce, these pan-fried dumplings stuffed with spiced minced pork and artistically shaped with single flat pasta strips won almost everyone’s approval, and was one of the fastest dishes to be cleared. We feel like this could be the perfect dish to share with co-workers, or gorge on during a melancholic dinner night. Highly raved about, the Ripperl is a stack of soft honey-brushed Bavarian pork ribs, and was a seasonal guest to the menu before, but will now stay as a permanent star. Earning its status with each flavorful bite of its beer-infused meat and thin candied coat, we throughly cleaned our slabs and wished for more. We had to make do with the Spatchcock, an equally masterful roasted 21 days old whole chicken whose golden skin cracked and white meat promised tenderness. 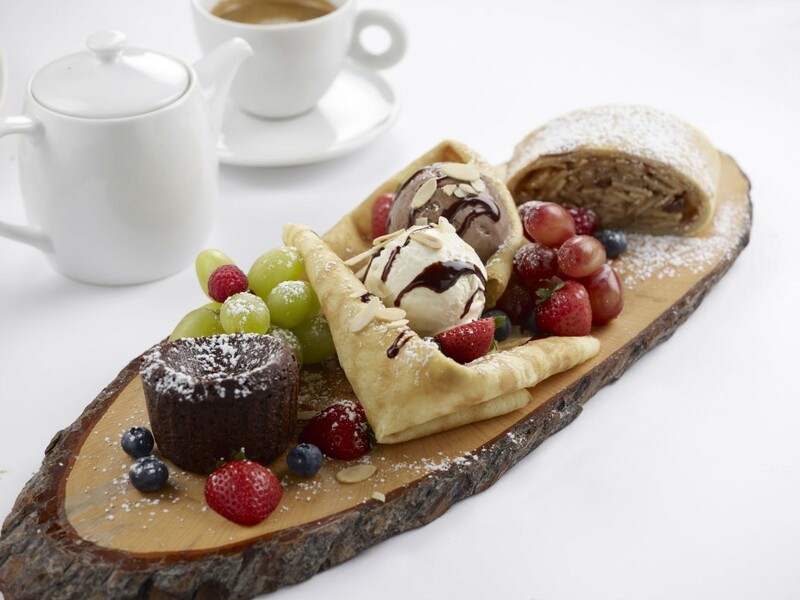 What better way is there to end the meal than with Nachspeisen Teller, a dessert medley featuring homemade apple strudel, warm mud cake, huge crepes with scoops of ice cream and a fresh collection of fruits? We can’t really answer this question after stuffing ourselves with crepe goodness and golden crispy apple bits. 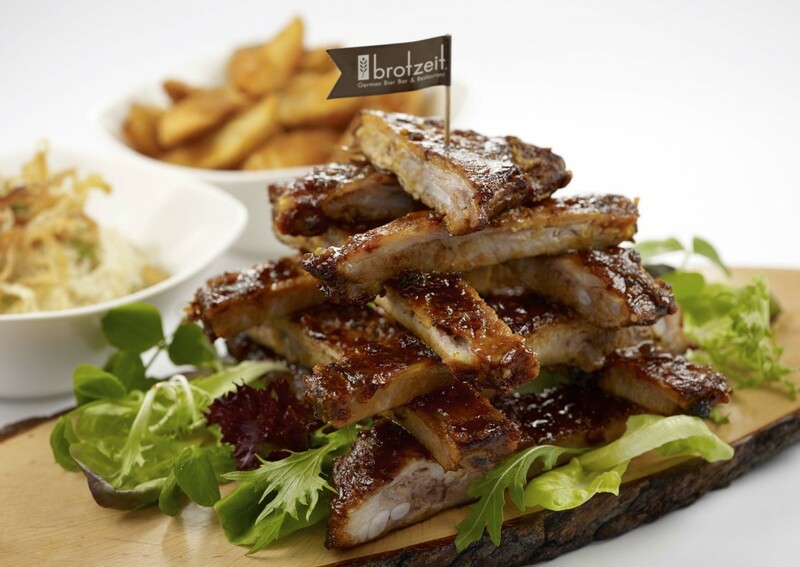 Embodying the same qualities of a good beer, Brotzeit ensures that everyone leaves the table full and warm. Full and warm we definitely are, but we are also already thinking about our next meal here. Guten Appetit! 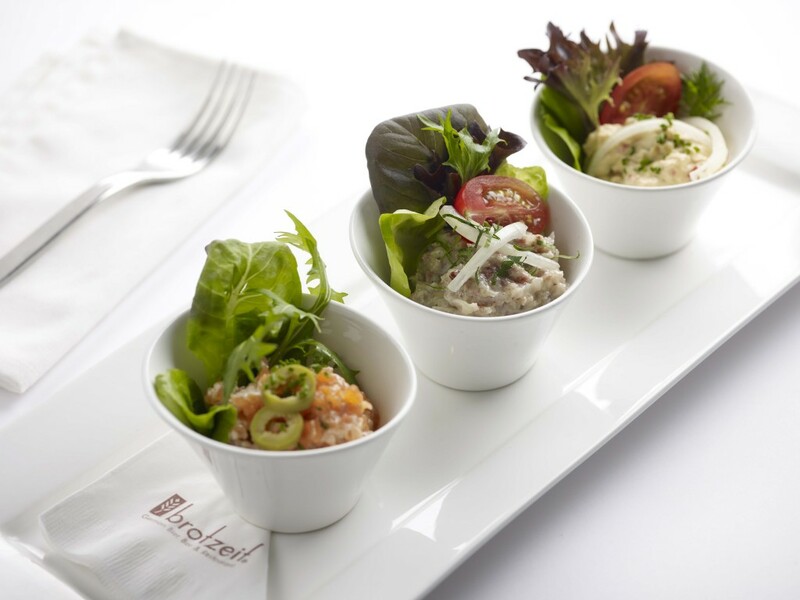 Check out Brotzeit’s website for more information about the new menu.